Since Tanylee Davis gave her account about an upsetting train journey on social media, there have been a flood of news reports on the inaccessibility of rail travel. A guard insisted that Tanylee move her mobility scooter when a mother with a pushchair then boarded the train. He then proceeded to inform all passengers via the tannoy that the train was delayed due to the woman with a mobility scooter refusing to move. Ms Davis, a comedian reported that the confrontation left her feeling humiliated and tearful for the rest of the journey. Speaking about the incident Tanylee has said she just wanted to highlight problems she had been encountering for the last 15 years. A statement that many of us would whole-heartedly agree with! There’s many reasons why train travel can be stressful for Disabled people including inaccessible booking, toilets, platforms, lack of ramps, inconsistent support to get on and off trains and at stations. I relayed a tale where I booked assistance for a journey which worked well at the outgoing station, was absent at a connecting station whilst the final station was unmanned. Many DEF members nodded in agreement and obviously had their own horror stories to tell. Such inconsistencies mean people can be stranded at stations or miss vital connections. The Equality and Human Rights Commission is calling for legal action against the government over its failure to ensure an accessible rail service. In Bristol problems can be reported to the Public Transport Group, if you email me I can inform the group. BDEF Co-chair, Suaad Walker, recently attended The Right Trousers event at UWE’s Future Space in their Robotics Lab. The event centred on a research project into robotic trousers to help those with impaired mobility. The location was fully accessible. The event was a showcase/feedback for some of the research that is being collaboratively worked on by several universities: Bristol, UWE, Leeds, Loughborough, Nottingham, Southampton and Strathclyde. Funding is a mix of EU and UK health funding to look at ways of using robotics to improve independent living. This event particularly focused on the use of robotics to overcome restricted mobility in terms of getting out of a chair/walking as well as reducing the problems associated with drop-foot syndrome. Bristol showcased their work with focus groups of elderly and disabled to identify exactly what kind of help is needed in a variety of different scenarios as well as helping the researchers to better understand the experience of impaired mobility. This feedback suggested that assistive trousers would need to be light-weight, cheap, comfortable, and easy to take on and off plus be washable! Resulted in a specialist 3D printer that combines viscous silicone with a hardener to produce a substance that is textile like and has the potential to act like an artificial muscle when stimulated. Precision motion capture technology that concentrates on joint functionality and has a built in feed-back similar to, but a major improvement, on current ‘health-wristband’ technology. A flat plastic, folded like a strip of origami paper that unfolds when electrically stimulated to simulate muscle activity. A flat tube of plastic that fills with air pressure to simulate muscle activity. A sequence of connected plastic beads that fill with air pressure to simulate muscle activity. An ‘activator’ small enough to clip onto a belt that contains enough compressed air for 100 ‘doses’ of ‘muscle activation’. A ‘slim’ sock designed to overcome the problems of foot drop incorporating a further form of artificial muscle. A pair of trousers incorporating many of the above developments. A pair of trousers that can be remotely lowered or raised when activated. 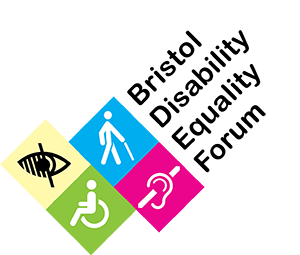 are invited to the next meeting of the Hidden Impairments Access Group to discuss our Access Needs and what we are going to do to improve the situation for ourselves and other Disabled people. 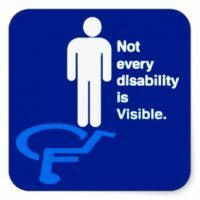 Previous topics of conversation have been cycling and Disabled people, how disgusting supermarket floors are to sit on, resting spaces in Bristol and the image of Disabled people. Please get in touch if you would like to join in via Skype.